Kevin Barrett of KAB Electro Acoustics has a business that few people would have thought viable two decades ago, when CD was making its charge to become the dominant physical format for recorded music. Kevin sells all manner of accessories for analog playback -- cartridges, replacement needles, turntable belts, record-cleaning supplies, record sleeves and various electronic items -- along with stock and modified Technics turntables. He has been in business for 18 years, and we last covered his wares on SoundStage! back in 1999, when Greg Weaver wrote about a trio of KAB products, including the Great Sound Escorts Stereo Canceler and KAB SpeedStrobe. Greg is long gone from the SoundStage! roster of writers, but Kevin Barrett's products are back. Actually, they never went away, or even increased much in price. The Stereo Canceler was $75 USD in 1999, while the SpeedStrobe was $89.95. Today, the Stereo Canceler sells for $79.95 and the SpeedStrobe for $99.95. The Stereo Canceler has uses in setting up a turntable, specifically in fine-tuning the cartridge's relationship to the record groove, and in playback. It sums the two stereo channels out of phase, canceling all sound produced by the lateral movement of the stylus. When you use it with a mono recording, it can aid in the optimization of azimuth, or the cartridge's perpendicularity to the record's groove, which determines the left-to-right balance and crosstalk performance between the channels. It can also be used to play back vintage vertical-cut recordings. Most people, I suspect, will buy the Stereo Canceler to help with setup; this is the way I used it. To use the Stereo Canceler for azimuth adjustment, connect it to your turntable and preamp's phono input, and play a mono record. Because the channels will be out of phase, the identical sound from one will cancel that of the other, leaving only the difference to be heard. If your stylus is favoring one channel over the other, and thus is out of absolute vertical alignment, you'll hear a louder signal through your speakers. Adjust for lowest output -- the point at which you hear the least signal from your speakers -- by tilting the headshell, and thus the stylus, right or left. Different tonearms have different ways of adjusting azimuth. The directions that came with your tonearm will explain how to do it, though keep in mind that some tonearms don't allow it at all. Power amplifiers  Lamm Industries M1.2 Reference and Audio Research Reference 110 stereo amplifier. Preamplifiers - Audio Research Reference 3, Aurum Acoustics Integris CDP. Analog - TW Acustic Raven AC turntable, Graham Engineering Phantom B-44 tonearm, Dynavector DRT XV-1s cartridge, Aurum Acoustics Integris CDP phono stage. Power products  Shunyata Research Anaconda Helix and Python Helix (Vx and Alpha variations), Essential Sound Products The Essence Reference power cords; Shunyata Research Hydra V-Ray power conditioner, Essential Sound Products The Essence Reference power distributor. There are other ways to determine the optimum azimuth setting, including measuring the output from each channel with a volt/ohm meter, using a mirror to adjust visually, and even using a very small, very light level on the headshell to determine levelness (provided that the top of the headshell is parallel to the underside, that is). The first is the most effective, but it's not nearly as easy to do as the others, including using the Stereo Canceler. However, I have a Graham Phantom B-44 tonearm whose Magneglide stabilizing system makes azimuth adjustment about as easy as possible. Even so, with the ability to make very small adjustments, I found it hard to determine the absolute least output with the Stereo Canceler, because small changes in volume were difficult to discern. I can only imagine how difficult this might be if I had to twist the headshell, for instance, instead of merely turning a knob, as the Graham tonearm allows. In contrast, the SpeedStrobe is dead simple to use. Speed inaccuracy is easily audible, though a turntable has to be off more than a split hair before it will be obvious to those of us without perfect pitch. 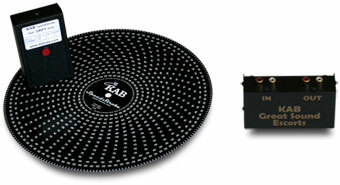 The SpeedStrobe comprises a 10" durable vinyl mat with markings for various speeds and a handheld, battery-operated, quartz-locked strobe. You put the mat on your turntable's platter, turn the motor on, aim the strobe's LED at the mat, and push the small button on its face. If you look at the mat, a number will stand out. That's the closest to the actual speed of your turntable. If the number is what you're after -- either 33 or 45 in most cases -- and stays absolutely still, your turntable is running at the correct speed and you're all set. If the number drifts counterclockwise, increase the speed until the number is still. If it drifts clockwise, decrease the speed. This is as easy as determining and setting the speed can get -- aside from having this feature built in to your turntable, that is. The adjustment directions are also printed on the strobe itself, so you don't have to guess at or remember how to make adjustments. While I can't say that I think the Stereo Canceler is a vitally important accessory -- I was able to adjust and set azimuth just as easily and effectively by other means -- it is useful for checking your work, or doing the job in the first place. The SpeedStrobe, however, isn't leaving here. It's all anyone needs to ensure that a turntable is running at the correct speed and thus in top form. With products like these, and so many others, it's no wonder that Kevin Barrett is still around -- and thriving -- long after the waning days of analog playback were predicted. If you play records, KAB Electro Acoustics has whatever you need. Prices: SpeedStrobe, $99.95 USD; Stereo Canceler, $79.95.